In our career we delivered speeches in hundreds of customer conferences, round tables and seminar series. Given that expertise, we can be support you in your events and presentations and in interacting with your targeted audience. There are known Guidelines for Preparing Effective Presentations and these tips apply regardless of whether the time for the presentations is short (less than 30 minutes) or long. Complaints about poor presentations have been received for decades and continue to be received. a. What is the problem and why? b. What has been done about it? c. What is the presenter doing (or has done) about it? d. What additional value does the presenter’s approach provide? e. Where do we go from here? Carefully budget your time, especially for short (e.g., 15 minute) presentations. Allow time to describe the problem clearly enough for the audience to appreciate the value of your contribution. This usually will take more than 30 seconds. Put your material in a context that the audience can relate to. It’s a good idea to aim your presentation to an audience of colleagues who are not familiar with your research area. Your objective is to communicate an appreciation of the importance of your work, not just to lay the results out. Keep it simple. The fact that you can include all kinds of cute decorations, artistic effects, and logos does not mean that you should. Fancy designs or color shifts can make the important material hard to read. Less is more. Use at least a 24-point font so everyone in the room can read your material. Unreadable material is worse than useless – it inspires a negative attitude by the audience to your work and, ultimately, to you. NEVER use a photocopy of a standard printed page as a display – it is difficult to overstate how annoying this is to an audience. Try to limit the material to eight lines per slide, and keep the number of words to a minimum. Summarize the main points – don’t include every detail of what you plan to say. Keep it simple. Limit the tables to four rows/columns for readability. Sacrifice content for legibility – unreadable content is worse than useless. Many large tables can be displayed more effectively as a graph than as a table. Don’t put a lot of curves on a graphical display – busy graphical displays are hard to read. Also, label your graphs clearly with BIG, READABLE TYPE. Use easily read fonts. Simple fonts like Sans Serif and Arial are easier to read than fancier ones like Times Roman or Monotype Corsiva. Don’t use italic fonts. Light letters (yellow or white) on a dark background (e.g., dark blue) often will be easier to read when the material is displayed on LCD projectors. Use equations (and/or complex data) sparingly if at all. 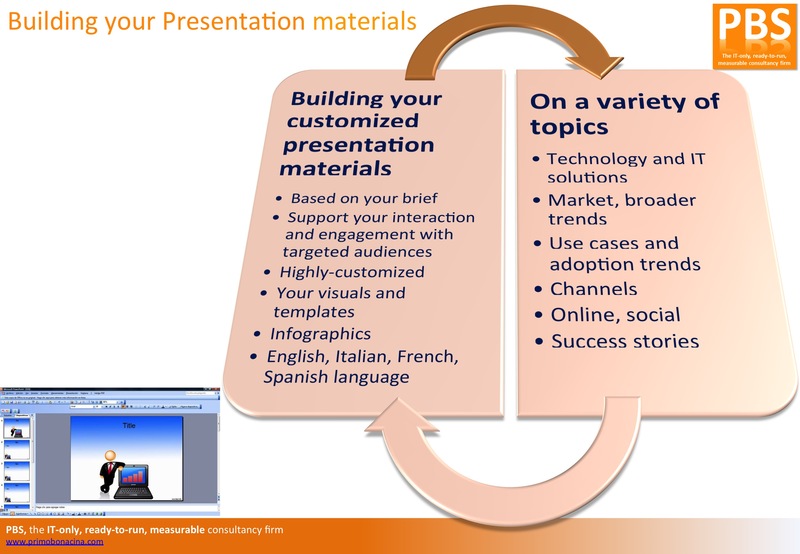 Presentation materials can be in Italian, English, French, Spanish language. As we write columns on the national press (offline and online) on a variety of trends, these articles can be made available as content to you.